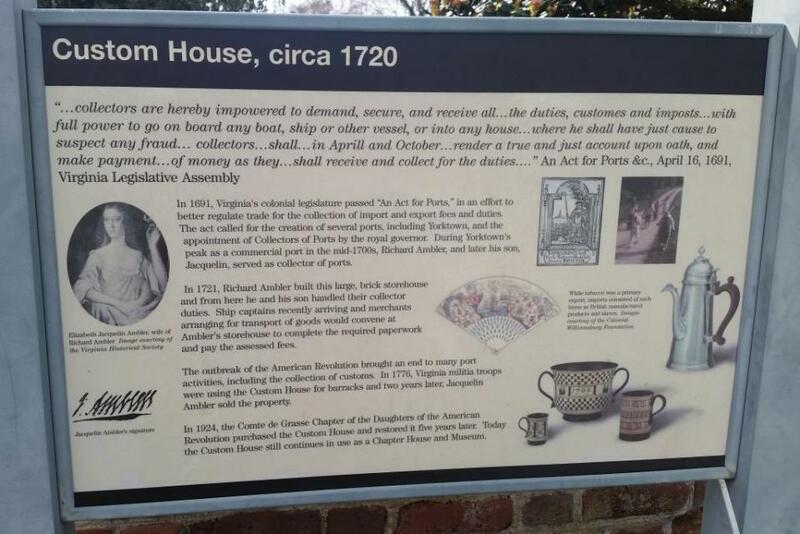 In 1691, Virginia's colonial legislature passed "An Act for Ports," in an effort to better regulate trade for the collection of import and export fees and duties. The act called for the creation of several ports, including Yorktown, and the appointment of Collectors of Ports by the royal governor. During Yorktown's peak as a commercial port in the mid-1700s, Richard Ambler, and later his son, Jacquelin, served as a collector of ports. In 1721, Richard Ambler built this large, brick storehouse and from here he and his son handled their collector duties. Ship captains recently arriving and merchants arranging for transport of goods would convene at Ambler's storehouse to complete the required paperwork and pay associated fees. 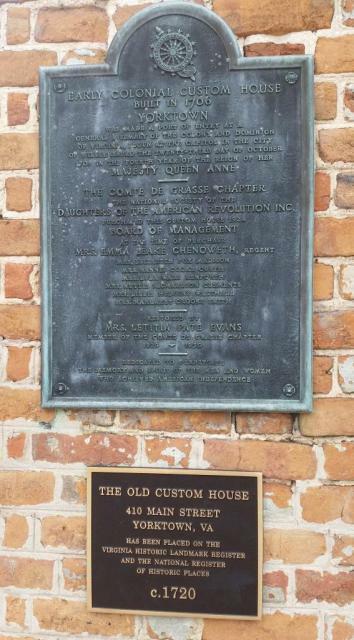 In 1924, the Compte de Grasse Chapter of the Daughters of the American Revolution purchased the Custom House and restored it five years later. Today the Custom House still continues in use as a Chapter House and Museum. I saw this marker and it is in excellent condition. This marker can also be identified by its HM code. You can use the hashtag #HM1J9U in tweets, and any other place where you might refer to this marker, including when searching on this site.